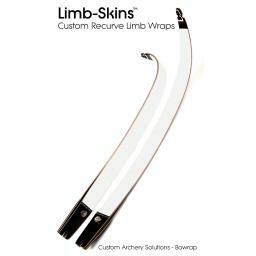 Limb-Skins™ by Bowrap.com are an innovative archery product that allows archers to easily customise and change the look of their recurve bow. Turn those bland and boring recurve limbs into a statement with a unique piece of limb art. These limb skin wraps feature a hexagonal crystalline structure pattern in red and black that looks fantastic on the bow. When you purchase Bowrap Limb-Skins you will receive 2 full colour CNC precision cut laminated skins that you simply apply to the front or inside face of the limbs. Limb-skins come laminated with a robust high gloss finish that offers an improved level of protection from light scuffs, minor abrasions, mud and dirt. 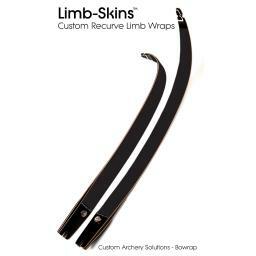 Bowrap Limb-Skins™ wraps are compatible with all wood, wood/carbon and carbon limbs that feature International Limb Fitting’s (ILF) from all major limb manufacturers such as Win & Win, KAP, Samick, Hoyt, Mybo, Core, Sebastian Flute, SF, MK Korea, Ragim & KG Archery. NOTE: Bowrap Limb-Skins are not shape compatible with Petron & Boarder Limbs as these have a very unique recurve element to the limb design. 2 High performance Limb-Skins per set. Large choice of unique graphics, patterns & colour combinations from subtle to loud and proud. High Gloss Laminated Finish protects your recurve limbs from minor scuffs and abrasions. Quick and easy to apply with ‘Step by Step How To’ articles & videos on Bowrap website. Easy to remove and change if required. Give your bow a different look each season. Every Limb-Skin Wrap set is handmade to order, checked, packed and sent by me, personally. Available in Short, Medium & Long to suit the majority of Limb sizes. Choosing a limb wrap design is the easy bit. Now you need to choose the correct size for your limbs. Most archers will have short, medium or long limbs with an ILF. Simply choose the limb skin size that matches your limbs from the product options. Choose limb wraps for Internal (inner), External (outer) or Both faces of the limbs. INNER SKINS as the name implies are designed to fit the inside of the limbs, this is the side of the limb you can see when you shoot the bow (the string side). These limb skins are slightly different in that they have a cut out where the string meets the bow. NOTE: We advise all competition archers not to apply limb skins to the inside face of your limbs. Certain designs could be construed as a sighting aid. An archery judge may well ask you to remove the inside skin. Avoid the risk of disqualification and heed this advice. OUTER SKINS are full face skins designed to be applied to the outer side of the limbs. The side you can't see when holding the bow. Outer Limb skins will not fail equipment inspections. Your Limb-Skins have arrived in the post. Yay! Pleased and excited you want to install them. Great! Follow this illustrated guide on How to Apply Limb Skins. Take your time and enjoy. Most recurve bow limbs sizes are classified as Short (S), Medium (M) or Long (L). Check your limbs and select the corresponding limb-skin size.Choose limb wraps for Inner, Outer or Both faces of your bows limbs. Inner Skins are designed to fit the inside of the limbs, this is the side of the limb you see when you shoot the bow (the string side). These limb skins have a cut out where the string meets the bow. PLEASE NOTE: We advise all competition archers NOT to apply limb skins to the inside face of your limbs. Certain designs could be construed as a sighting aid. An archery judge may well ask you to remove the inside skin. Avoid the risk of disqualification and heed this advice. Outer Limb skins are full face skins designed to be applied to the outer side of the limbs. The side you can't see when holding the bow. Outer Limb skins will NOT fail equipment inspections.